When you come to Catalina Cafe in Hobsonville on a sunny day you might notice the pathways and pavement around it glistening in the sun. Welcome to GlassCrete™ where waste paint and waste glass meet concrete. The path to GlassCrete began when we first commenced the Resene PaintWise programme. Resene PaintWise is a product stewardship programme which takes back unused/unwanted paint and paint packaging via Resene ColorShops. Early on the mission was to make sure all materials taken back were recycled in some form. There was some evidence internationally that waste paint was being used in concrete making. It was also known that virgin polymer additives added beneficial properties, such as improved flow, tensile strength, adhesion; and reduced shrinkage and reaction of susceptible aggregates, in high priced mortars and grouts. The aim was to replicate these benefits using waste paint instead. This led to the formation of the PaintCrete Partnership where Resene and 3R teamed up with Fletcher Concrete & Infrastructure (Golden Bay Cement, Firth and latterly Winstone Aggregates) to develop ‘cementitious applications’ for waste paint in concrete. Out of that work came PaintCrete™. The first application for PaintCrete was in blockfill or grout, closely followed by footpaths, as PaintCrete works best in a range of standard 17/20Mpa type applications. The benefits are in line with those identified for virgin polymer additives, and further trials and refinements have made it possible to lower the cement content of the concrete and still achieve the required compressive strength for the application. Early on the partners also identified that enabling waste bottle glass to be recycled successfully in concrete would help with the growing leftover glass problem. The barrier to using glass in this way previously was the alkali silica reaction (ASR) where the silica rich glass and alkali rich cement paste react to produce a gel that expands and causes cracking. The partnership led by 3R has been trialling and perfecting a recipe, which uses the core technology in PaintCrete to enable ASR to be overcome. While not perfected yet (a concerted programme of lab and field trials and testing is underway) the signs that GlassCrete works are very encouraging. 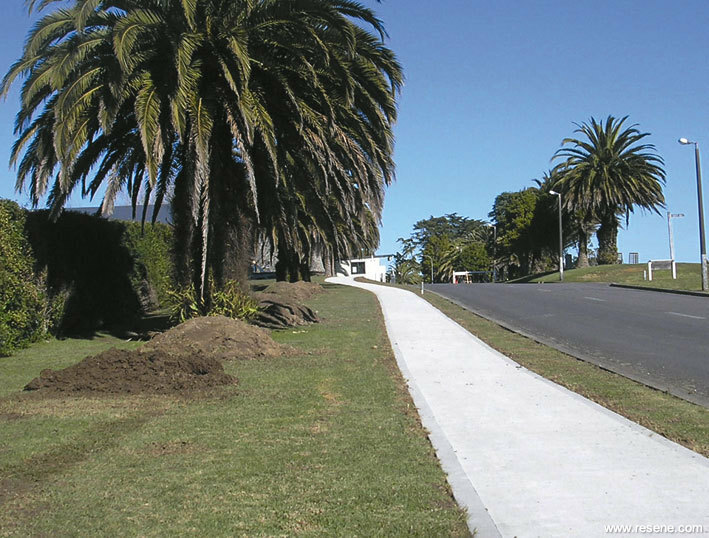 Thanks go to Mike Kennedy of the Hobsonville Land Co and his team and Dempsey Wood who did the surrounding footpaths for recognising the potential of GlassCrete and providing the opportunity to trial GlassCrete in a ‘real life’ situation. 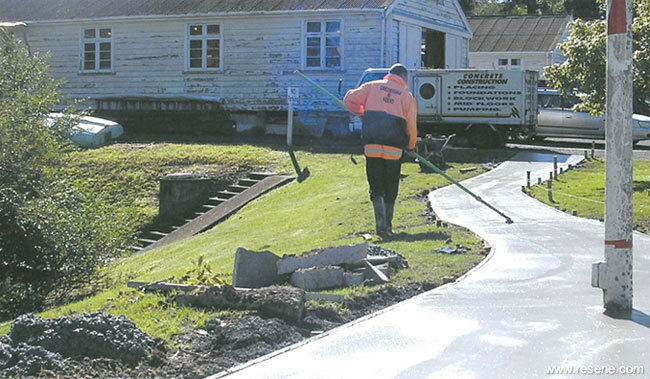 This footpath alone saved over 40 tonnes of crushed waste glass destined for the tip and gave it a new lease of life in the footpath, along with many many litres of recycled paint that had been collected via the PaintWise programme. The ultimate aim is to produce a durable surface using wastes that would otherwise be discarded and, at the same time, lower the carbon footprint of the concrete and make it truly more sustainable. Industry readers interested in being updated on PaintCrete and GlassCrete as they are developed further can contact Pat Kane of 3R Group, phone: 0508 374 768 (NZ). 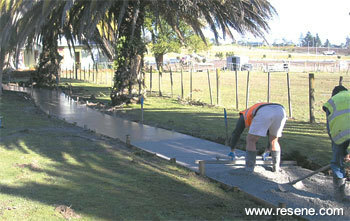 View hundreds of case studies of Resene products used on projects all over New Zealand and Australia.